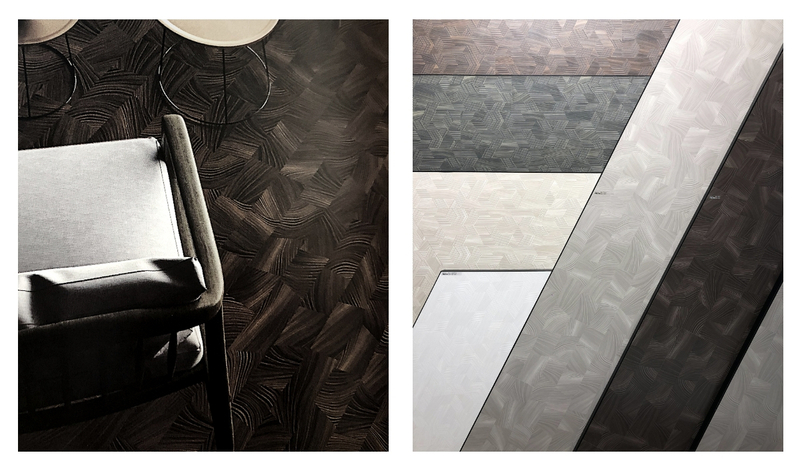 Are you curious to see top 5 trends and my favourite picks from the world of Domotex? January is the month of new outlook not only to life but also to design. The best way to get the insight into what 2019 will be about is visiting the most important fairs and events in the industry. 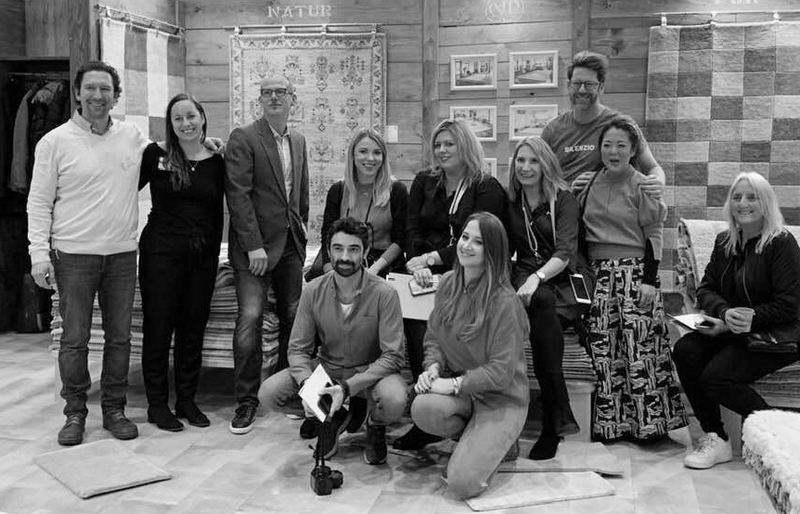 Together with a group of design bloggers and influencers we kicked off the year in Hannover, returning to the biggest flooring fair – Domotex for the second time. 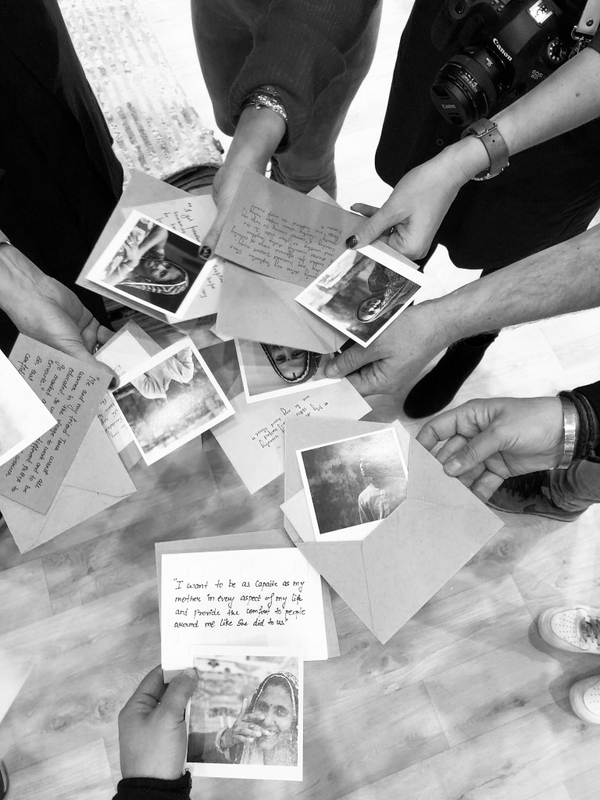 This year’s keynote theme was Create’n’Connect highlighting the importance of how we will live, work and interact with one another in the future. It goes without saying that floors play an important role in shaping our environment. 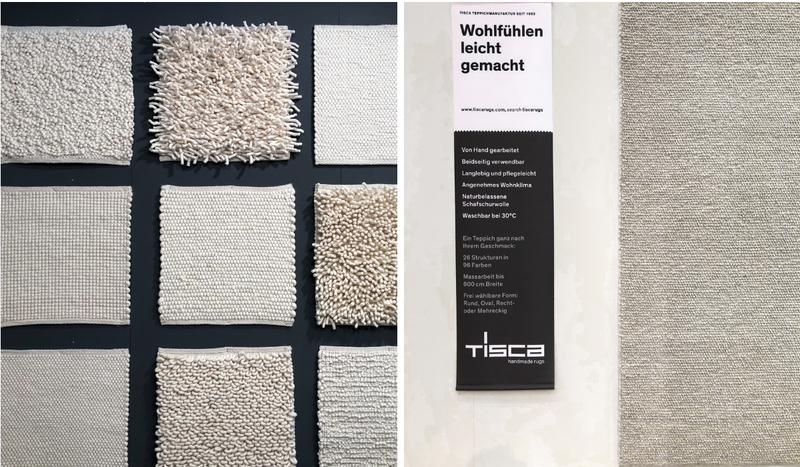 Floors support us, guide us and connect us – that’s what Domotex 2019 was all about. 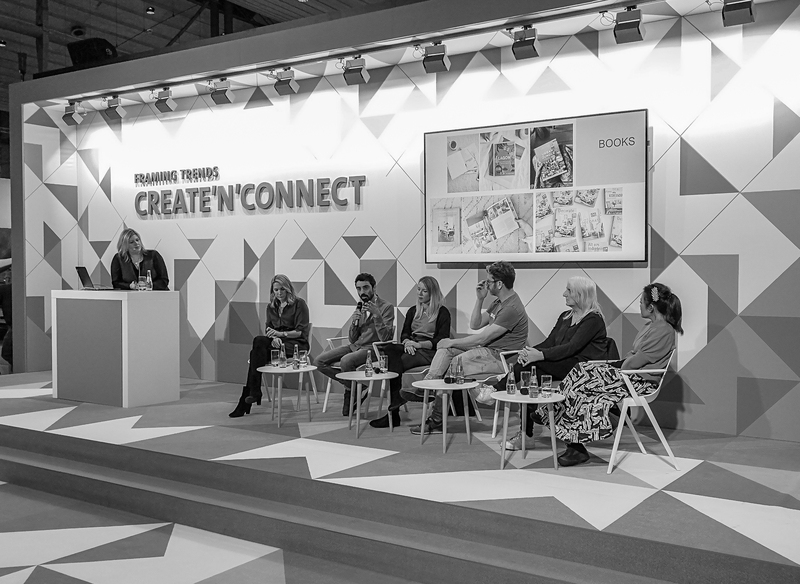 We spent two days at the fair, touring the inspiring halls filled with the variety of rugs and floors from all around the world, we participated in the panel discussions on stage talking about our work, how brands can collaborate with us and presented our trend forecast featuring 21 lifestyle and design trends. 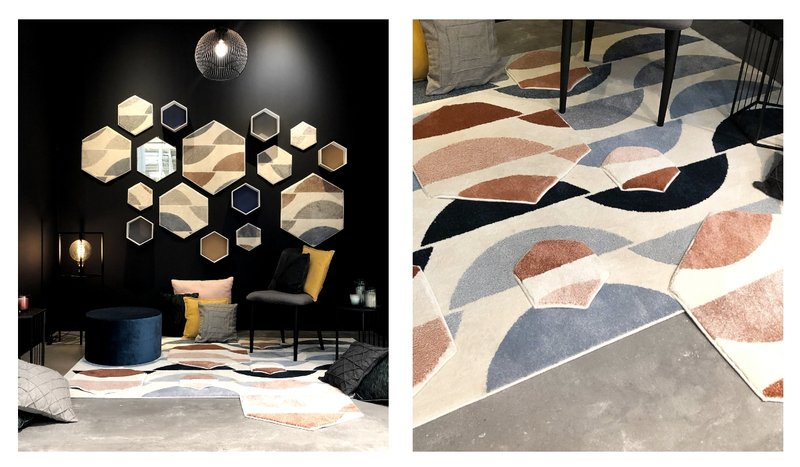 My summary from Domotex will focus on the Top 5 trends which were most visible at the fair and my favourite designs/stands representing them. 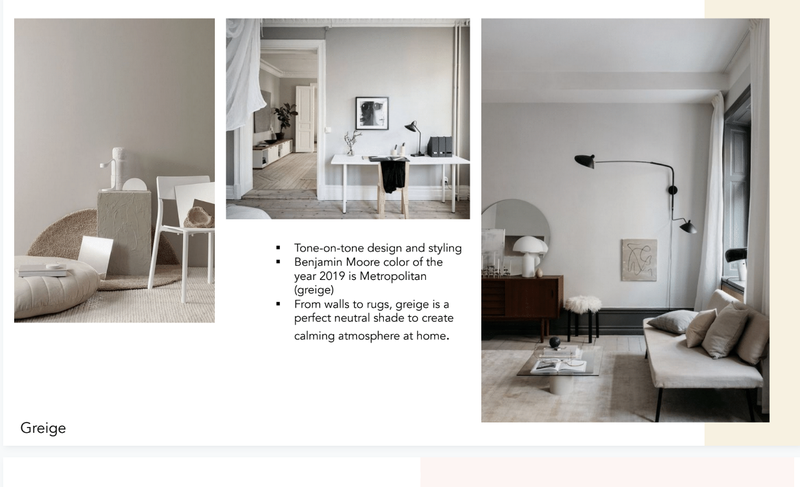 Greige has been announced as the color of 2019 by Benjamin Moore. It’s a perfect neutral shade, inbetween grey and beige, as the name suggests. Why is it big this year? Simply because we associate it with balanced life, harmony and resting environment. We seek sanctuary in our homes, that’s why decorating with greige is becoming more popular in the technologically stressed world. 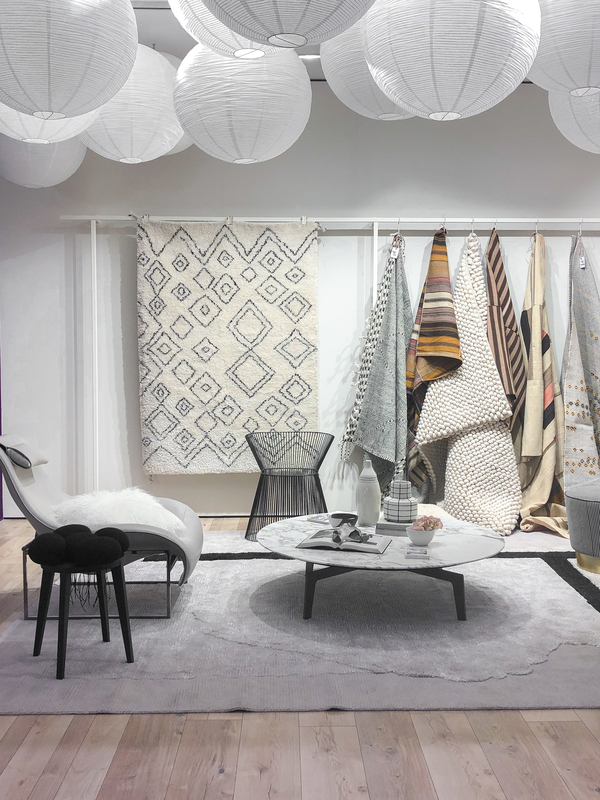 Domotex was filled with rug designs in resting neutrals, soft materials from the high quality wool. 1/ Tisca rugs turned out to be one of my favourites again. After discovering the brand last year at Domotex I was very much looking forward to visit their stand and see new designs. Unique, hand-woven rugs come in many different forms enhancing the natural palette – between whites, beige and greys, in many different shapes. 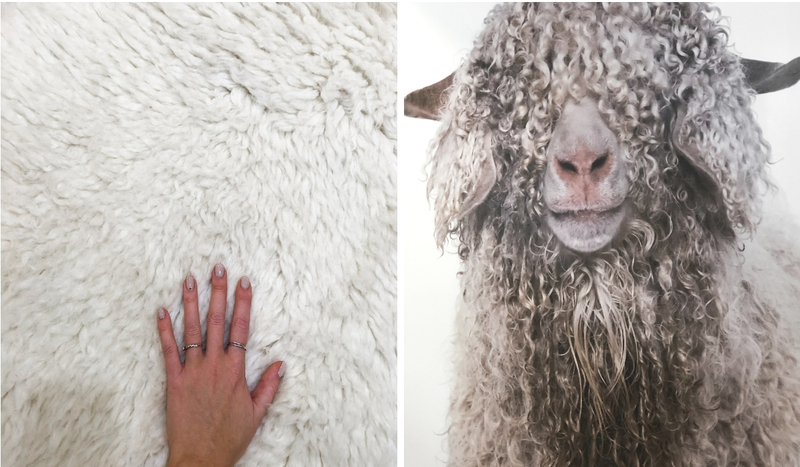 2/ Natur Pur – an Australian brand with eco-friendly rugs in natural materials. Grey and beige was dominating their stand where we had a coffee with the lovely owners. Designers in 2019 have a very responsibe role in shaping the future. Product design is no longer only about shape and form of the object, but also about solving current problems and changing our perception. The one problem to name is waste and re-imagining our relation to it: what can be done, how we can use it and possibly transform it into new products. Coral Garden was my favourite conceptual design at the fair. 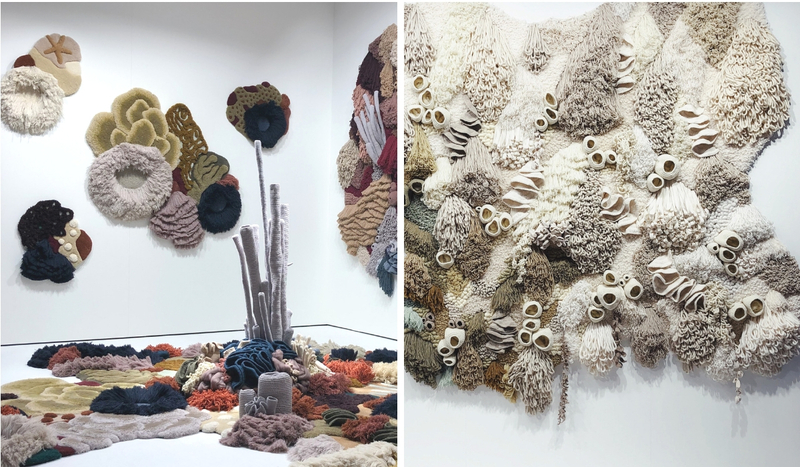 With the mass textile industry being one of the most polluting in the world bringing harm to our planet, designer Vanessa Baragoa created an installation highlighting the problem of the coral reef. 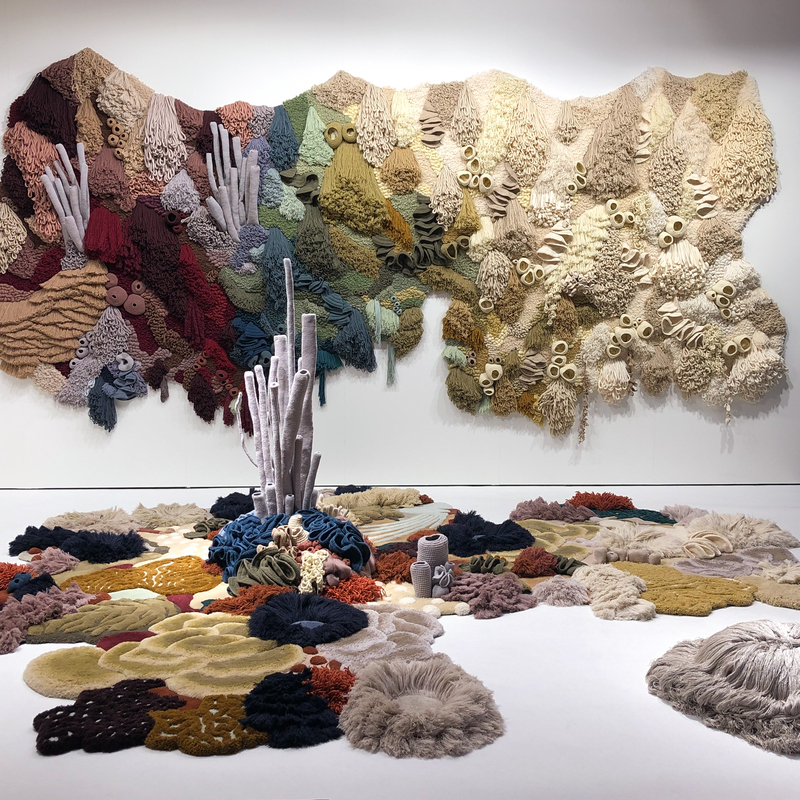 Made of recycled wool, the scultpural rug shows a transformation from the living coral (colorful, left side) to slowly dying marine (whites, right side). Story-telling and curated collections are big social trends in 2019. Inspiring, lifestyle setting, showing concept, products in use, giving decorating ideas is what attracts our attention the most these days. 1/ Holly Becker is a founder of one of the first design blogs – Decor8, a book author, journalist, stylist but also my very good friend! Her beautifully styled booth in the Trending Frames area was a representation of recent tendencies, featuring some of the best-looking rugs from the fair, walls painted with Farrow and Ball paints, furniture from Steinhoff store and personal items resulting in a cosy, inspiring corner, only Holly Becker could create! Focus on handmade and on bringing local craftsmanship from various parts of the world to the urban tribe. 1/ Jaipur rugs – What stood out for me was the story behind the Jaipur rugs, the process and the personal note from the weavers in India. A precious message making the design unique. 2/ Edelgrund – I also found inspiring the story behind the Edelgrund Iranian rugs. There is no factory or a technological production line. Each rug is being made by a person, in their own home, in the mountains. How does it work? 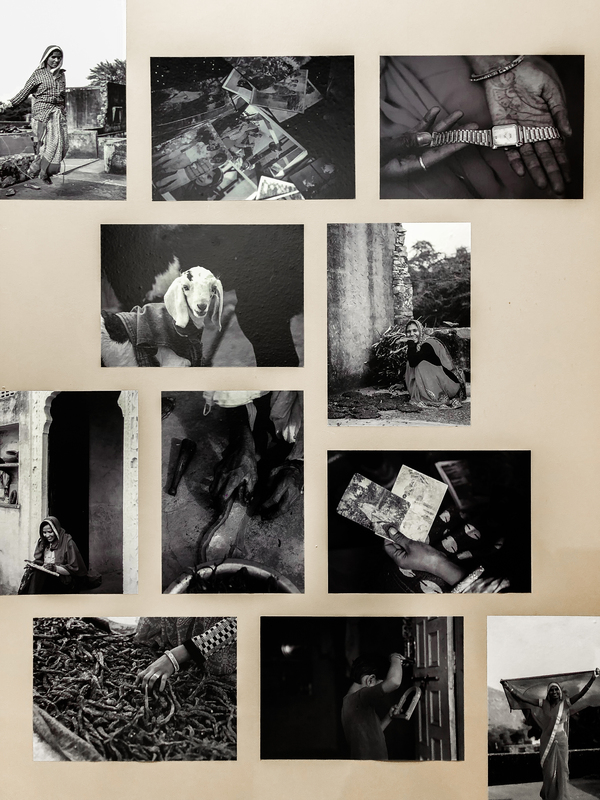 The rug’s design together with a photo and materials is being sent directly to the people who in the comfort of their home create those beautiful designs. We seem to love graphics in 2019! 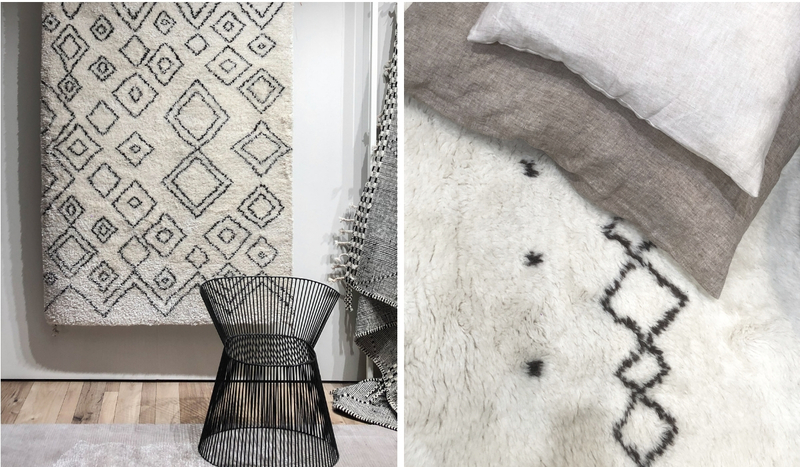 They were very much visible and alive at the Domotex this year – from soft, minimal lines to more bold, colorful patterns. Below you can see a few of my favourites. 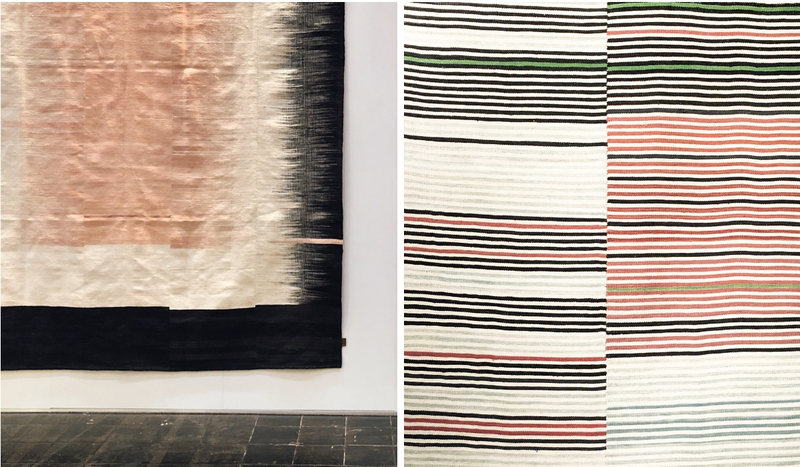 1/ Rica Basagoiti – gorgeous, graphical rug made with natural materials in Spain. 2 & 3 / Jaipur rugs with delicate graphical patterns, made in India. 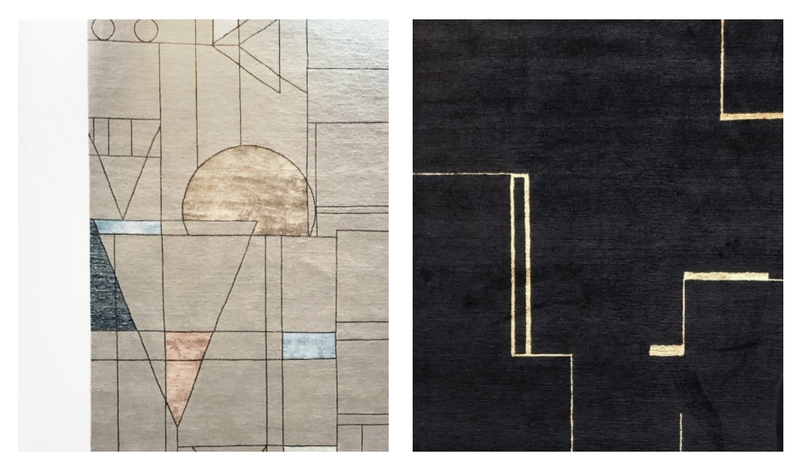 Kristina Lassus – minimal golden graphics on a black rug, made in Nepal. 4 & 5 / A graphical heaven spotted at McThree, a leading flooring company from Belgium. 6& 7 / AGT Design – Innovation in HDF flooring technology – a soft, calming pattern with a direct reference to natural veins. Comes in different colors and forms. 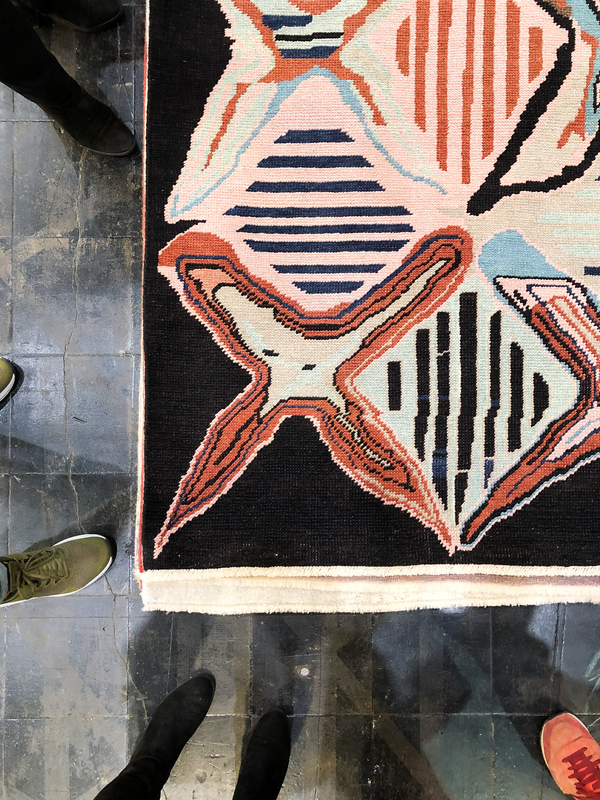 To sum up I spotted 5 great trends repeating in the world of flooring – greige rugs, rugs and floors made of recycled materials, curation and storytelling, handmade rugs with focus on local craftmenship and graphical patterns on all types of floors. Which one is your favourite? Which one would you bring home with you? The great thing about visiting the fair with a group of bloggers is providing different perspectives on what we see at the fair. Having different tastes and favourites, our combined Domotex report gives a complete insight into the fair and recednt trends. 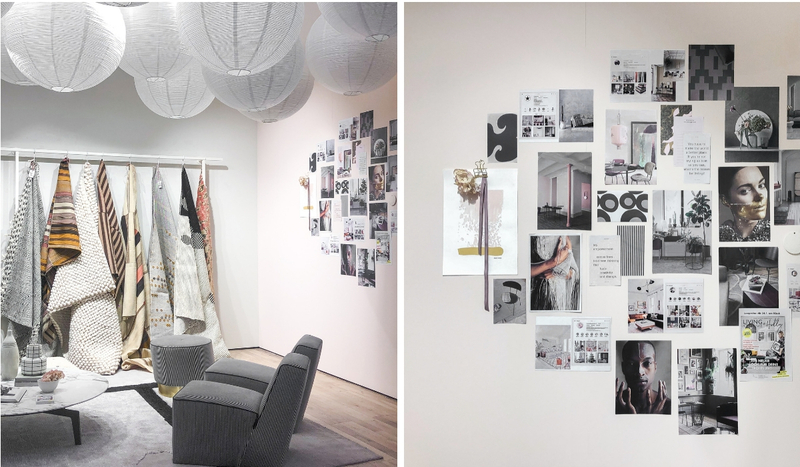 Make sure to read all the posts written by my dear blogger friends: Holly from Decor8 (our host and tour curator), Desiree (Vosgesparis), Mette (Monstercircus), Niki (My Scandinavian Home), Igor (Happy Interior Blog and Urban Jungle Bloggers) and Stefan (Trendstefan). Hope you enjoyed mine too! This post has been written in collaboration with Deutsche Messe / Domotex. All expressed opinions are my own.